What Does ONC-ATCB & CCHIT Certified Mean? This product has been inspected against integrated functionality, interoperability and security criteria independently developed by CCHIT's broadly representative, expert work groups. Using CCHIT's testing methods, this product has been found in full compliance with the criteria in effect on the date of inspection. 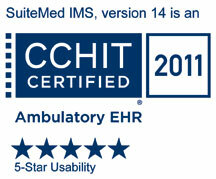 ©2012 Inspected and certified by the Certification Commission for Health Information Technology (CCHIT®). .170.304(f) Electronic copy of health information. .Meets this criterion .NOT inspected or certified©2012 Inspected and certified by the Certification Commission for Health Information Technology (CCHIT®). CCHIT is an Office of the National Coordinator - Authorized Testing and Certification Body (ONC-ATCB). SuiteMed IMS (Intelligent Medical Software), is a HIPAA-Compliant, fully-integrated EMR and Practice Management software for single and multi-physician facilities.